Why a Gantt Chart is Effective for Project Management? Gantt charts have now been widely used in project management for better team communication, higher productivity and advanced resource management. Explore more key aspects in this article to see why a Gantt chart is effective for project management. Before we analyse the importance of using Gantt charts in project management, let's first go through the basic concept of such charts. Generally, a Gantt chart is a presentation of project tasks scheduled over a period. It is used for setting up and managing projects of different sizes. You can check out many task details in a Gantt chart including task start and finish date, the assignment of resources, milestones, task priorities and so on. Furthermore, professional project management software can offer users more advanced functions such as budget reports based on their Gantt charts. Why Use Gantt Charts in Project Management? If you are struggling with predicting the duration and resources for your project, or if you feel the paper-based to-do list is too simple to help you to finish tasks, try using Gantt charts to solve these problems. You may have heard about Gantt charts before, but you may not know how powerful can such charts be in project management. Now we would love to share more insights about Gantt charts based on the following most significant points. Team members can easily spot major components and centralized information for their project: what, who, when, where, why and how. In advanced Gantt charts, tasks may also be shown as visually appealing and memorable color-coded horizontal lines for different teams. These factors are also quite useful for project meetings, where you may need to report the current key issues of your project. 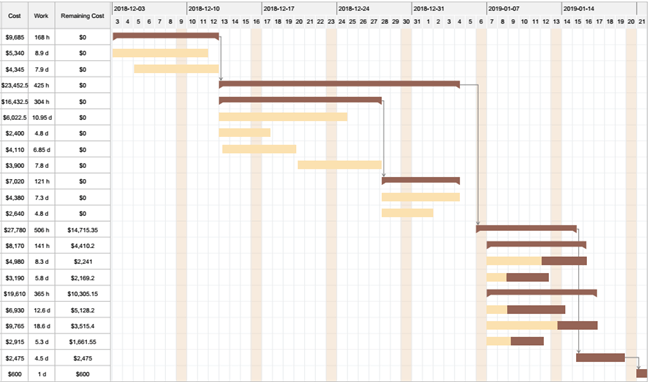 Gantt charts are collapsible, expandable and show clear divisions of labor within a team. Therefore, individuals can check out their own appropriate level of duties while the project manager or the team leader can monitor the overall pattern. In reality, problems may occur if there exist overload resources, or the limited use of resources. However, by using detailed-oriented Gantt charts, project managers can assign tasks more effectively across business resources such as budget, equipment and materials. In this case, managers are easy to measure the capacity of teams in different departments for a more accurate decision of the scope and budget. Besides, it could be also great to bring the good news of a low budget to your external business partners or sponsors. For the past plan, team leaders may draw conclusions from filling more time gaps between tasks. 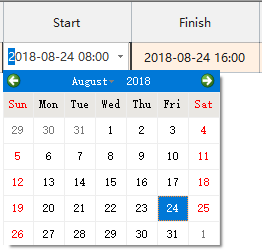 4 if in the case of unforeseen events during a project that may probably occur to nearly every project team, team leaders can react and modify quickly in their calendar-view based Gantt charts. For, example, adjusting the dates or working hours of an individual task or re-setting milestones for delayed tasks. For the future plan, decision-makers can look farther ahead to make sure every task is working toward the final strategic goal of their team. More ideally, the project team may find out some shortcuts for their tasks to achieve goals ahead of the schedule. Lacking communication seems to be a big problem for business organizations to overcome workplace failures. However, with the use of Gantt charts in project management, all the roles involved are clearly to see who is working on what specific tasks or programs, and whether there are some potential problems etc. Such cases eliminate the need to use a separate software for the team communication purposes since everyone is on the same page so misunderstanding or excuses of task faulty can be avoided. The milestone in a Gantt chart can be used as motivational factors to encourage the whole project team to achieve goals. You can set milestones based on weekly or monthly frequency according to specific tasks or deadlines. As the increasing demand of cross-department projects with multiple teams, the usage of Gantt charts can fit a wide range of professional roles and fields in project management: business project managers, construction managers, operations managers, marketing managers, external partners, engineering, manufacturing, infrastructure, software development, and governmental works etc. Gantt charts efficiently align groups of people who do not have professional project management skills, such as stakeholders with different knowledge background, to let them know what is going on. Therefore, all types of stakeholders can conduct their efforts based on the desired plan. Using Gantt charts in this way is like building a bridge between the project team and the supporters. The following free Gantt chart examples and templates includes the main categories of Gantt chart for construction management and business projects. Feel free to click on any of them to see more details. How to Create a Gantt Chart Easily? Gantt charts can be created by using a spreadsheet, or by project management software for more complex programs. Feel free to quickly add new tasks, set data formats and units, name tasks, build task dependencies, manage resources and generate reports etc. For more functions, please click on the free download button at the bottom of this page to have a try now.